Prince Rogers Nelson (June 7, 1958 – April 21, 2016) was an American singer-songwriter, actor, multi-instrumentalist, philanthropist, dancer and record producer. He was a musical innovator who was known for his eclectic work, flamboyant stage presence, extravagant dress and makeup, and wide vocal range. His music integrates a wide variety of styles, including funk, rock, R&B, new wave, soul, psychedelia, and pop. He has sold over 100 million records worldwide, making him one of the best-selling artists of all time. He won seven Grammy Awards, an American Music Award, a Golden Globe Award, and an Academy Award for the film Purple Rain. He was inducted into the Rock and Roll Hall of Fame in 2004, his first year of eligibility. Rolling Stone ranked Prince at number 27 on its list of 100 Greatest Artists, "the most influential artists of the rock & roll era". In February 1981, Prince made his first appearance on Saturday Night Live, performing "Partyup". In October 1981, Prince released the album, Controversy. He played several dates in support of it, at first as one of the opening acts for the Rolling Stones, on their US tour. He began 1982 with a small tour of college towns where he was the headlining act. The songs on Controversy were published by Controversy Music – ASCAP, a practice he continued until the Emancipation album in 1996. By 2002, MTV News noted that "ow all of his titles, liner notes and Web postings are written in his own shorthand spelling, as seen on 1999's Rave Un2 the Joy Fantastic, which featured 'Hot Wit U.'" During this period Prince referred to his band as the Revolution. The band's name was also printed, in reverse, on the cover of 1999 inside the letter "I" of the word "Prince". The band consisted of Lisa Coleman and Doctor Fink on keyboards, Bobby Z. on drums, Brown Mark on bass, and Dez Dickerson on guitar. Jill Jones, a backing singer, was also part of the lineup for the 1999 album and tour. Following the 1999 Tour, Dickerson left the group for religious reasons. In the book Possessed: The Rise and Fall of Prince (2003), author Alex Hahn says that Dickerson was reluctant to sign a three-year contract and wanted to pursue other musical ventures. Dickerson was replaced by Coleman's friend Wendy Melvoin. At first the band was used sparsely in the studio, but this gradually changed during the mid-1980s. According to his former manager Bob Cavallo, in the early 1980s Prince required his management to obtain a deal for him to star in a major motion picture, despite the fact that his exposure at that point was limited to several pop music hits and music videos. This resulted in the hit film Purple Rain (1984), which starred Prince and was loosely autobiographical, and the eponymous studio album, which was also the soundtrack to the film. The Purple Rain album sold more than 13 million copies in the US and spent 24 consecutive weeks at No. 1 on the Billboard 200 chart. 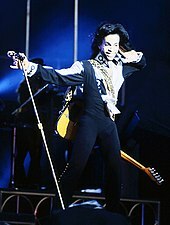 The film won Prince an Academy Award for Best Original Song Score and grossed over $68 million in the US. Songs from the film were hits on pop charts around the world; "When Doves Cry" and "Let's Go Crazy" reached No. 1, and the title track reached No. 2 on the Billboard Hot 100. At one point in 1984, Prince simultaneously had the No. 1 album, single, and film in the US; it was the first time a singer had achieved this feat. The Purple Rain album is ranked 72nd in Rolling Stone's 500 Greatest Albums of All Time; it is also included on the list of Time magazine's All-Time 100 Albums. The album also produced two of Prince's first three Grammy Awards earned at the 27th Annual Grammy Awards—Best Rock Performance by a Duo or Group with Vocal and Best Score Soundtrack for Visual Media. On February 2, 2007, Prince played at the Super Bowl XLI press conference. Prince performed at the Super Bowl XLI Halftime Show in Miami, Florida on February 4, 2007, on a large stage shaped like his symbol. The event was carried to 140 million television viewers, his biggest ever audience. In 2015, Billboard.com ranked the performance as the greatest Super Bowl performance ever. The first projects to be announced following Prince's death were a greatest hits album, 4ever, which was released in November 2016, and an expanded and remastered reissue of Purple Rain for 2017. An EP featuring six unreleased Prince recordings, titled Deliverance, was announced on April 19, 2017, with an expected release date for later that week. The next day, Prince's estate was granted a temporary restraining order against George Ian Boxill - an engineer who co-produced the tracks and was in possession of the master tapes - and halted the release of the EP. Prince saw Dr. Michael T. Schulenberg, a Twin Cities specialist in family medicine in Excelsior, on April 7, 2016, and again on April 20. On April 7, Prince postponed two performances at the Fox Theatre in Atlanta from his Piano & A Microphone Tour; the venue released a statement saying he had influenza. Prince rescheduled and performed the show on April 14, even though he still was not feeling well. While flying back to Minneapolis early the next morning, he became unresponsive, and his private jet made an emergency landing at Quad City International Airport in Moline, Illinois, where he was hospitalized and received Narcan, but he left against medical advice. Representatives said he suffered from dehydration and had influenza for several weeks. Prince was seen bicycling the next day in his hometown of Chanhassen. 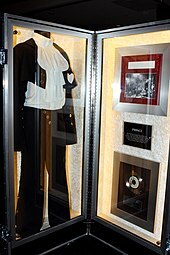 He shopped that evening at the Electric Fetus in Minneapolis for Record Store Day and made a brief appearance at an impromptu dance party at his Paisley Park recording studio complex, stating that he was feeling fine. On April 19, he attended a performance by singer Lizz Wright at the Dakota Jazz Club. The Los Angeles Times called Prince "our first post-everything pop star, defying easy categories of race, genre and commercial appeal." Jon Pareles of The New York Times described him as "a master architect of funk, rock, R&B and pop", and highlighted his ability to defy labels. Los Angeles Times writer Randall Roberts called Prince "among the most versatile and restlessly experimental pop artists of our time," writing that his "early work connected disco and synthetic funk [while his] fruitful mid-period merged rock, soul, R&B and synth-pop." Simon Reynolds called him a "pop polymath, flitting between funkadelia, acid rock, deep soul, schmaltz—often within the same song". AllMusic wrote that, "With each album he released, Prince showed remarkable stylistic growth and musical diversity, constantly experimenting with different sounds, textures, and genres [...] no other contemporary artist blended so many diverse styles into a cohesive whole." Journalist Nik Cohn described him as "rock's greatest ever natural talent". His singing abilities encompassed a wide range from falsetto to baritone and rapid, seemingly effortless shifts of register. 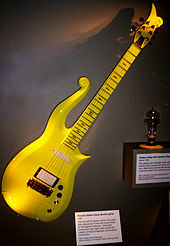 Prince was also renowned as a multi-instrumentalist. He was considered a guitar virtuoso and a master of drums, percussion, bass, keyboards, and synthesizer. On his first five albums, he played nearly all the instruments, including 27 instruments on his debut album, among them various types of bass, keyboards and synthesizers. Prince was also quick to embrace technology in his music, making pioneering use of drum machines like the Linn LM-1 on his early '80s albums and employing a wide range of studio effects. The LA Times also noted his "harnessing new-generation synthesizer sounds in service of the groove," laying the foundations for post-'70s funk music. Prince was also known for his prolific and perfectionist tendencies, which resulted in him recording large amounts of unreleased material. Over the years Prince was romantically linked with many celebrities, including Kim Basinger, Madonna, Vanity, Sheila E., Carmen Electra, Susanna Hoffs, Anna Fantastic, Sherilyn Fenn, and Susan Moonsie of Vanity 6 and Apollonia 6. Prince was engaged to Susannah Melvoin in 1985. When he was 37, he married his 22-year-old backup singer and dancer Mayte Garcia, on Valentine's Day 1996. They had a son named Ahmir Gregory Nelson on October 16, 1996; he was born with Pfeiffer syndrome and died a week later. Prince and Mayte divorced in 1999. In 2001, Prince married Manuela Testolini in a private ceremony; she filed for divorce in May 2006. ^ "Prince – Past Grammy Awards". The Recording Academy. Retrieved April 28, 2016. ^ "American Music Awards". showbiz411.com. Retrieved November 20, 2016. ^ "Golden Globe Awards". goldenglobes.org. Retrieved February 27, 2010. ^ a b Thompson, Ahmir (March 24, 2004). "100 Greatest Artists". Rolling Stone. Retrieved May 4, 2016. ^ a b c Petridis, Alexis (November 12, 2015). "Prince: 'Transcendence. That's What You Want. When That Happens – Oh, Boy.'". The Guardian. Retrieved April 21, 2016. ...a man who can play pretty much any instrument he choses , possessed of a remarkable voice that can still leap effortlessly from baritone to falsetto. ^ Taneja, Nikhil (December 9, 2008). "Those chart busters". Hindustan Times. Mumbai: HT Media. OCLC 231696742. Retrieved April 18, 2009. ^ "BMI | Repertoire Search". Repertoire.bmi.com. Retrieved July 18, 2009. ^ "R.I.P. Razzie "Winner" and Under the Cherry Moon Star Prince...". Golden Raspberry Awards. Archived from the original on April 13, 2016. Retrieved April 22, 2016. ^ Prince & The New Power Generation Discography Archived February 5, 2009, at the Wayback Machine.. discogs. Retrieved April 15, 2009. ^ a b Carter, Andrew (June 23, 1999). "The People Formerly Known as Fans". City Pages. Archived from the original on October 14, 2008. Retrieved December 12, 2007. ^ "BMI credits for "Betcha By Golly Wow!"". Repertoire.bmi.com. Retrieved July 18, 2009. ^ "BMI credits for "La-La Means I Love You"". Repertoire.bmi.com. Retrieved July 18, 2009. ^ "So What the Fuss credits". Discog. ^ "Golden Globe Awards". goldenglobes.org. ^ "3RDEYEGIRL – PLECTRUMELECTRUM". New Album – PLECTRUMELECTRUM. Retrieved September 30, 2014. ^ Kreps, Daniel. "Unreleased Prince Songs Prepped for Greatest Hits, 'Purple Rain' Reissue". Rolling Stone. Retrieved October 21, 2016. ^ Minsker, Evan. "Unreleased Prince Songs Coming on New EP, "Deliverance" Shared: Listen | Pitchfork". pitchfork.com. Retrieved 22 April 2017. ^ Flanagan, Andrew. "'Deliverance' Denied: Release Of Posthumous Prince Record Stopped By Judge". NPR.org. Retrieved 22 April 2017. ^ Variety Staff (April 21, 2016). "Prince Reportedly Treated for Drug Overdose Before Death; 911 Details Released". Variety. Retrieved May 9, 2016. ^ a b Brown, August; Rottenberg, Josh (April 21, 2016). "Prince, master of rock, soul, pop and funk, dies at 57". Los Angeles Times. Retrieved May 1, 2016. ^ Wilson, Carl (April 22, 2016). "The Purple One 151 53 Black or white, straight or gay, rock or R&B, male or female—Prince transcended every category.". Slate. Retrieved April 23, 2016. ^ a b c d e f g Cole 2005, p. 226. ^ Reynolds, Simon (April 22, 2016). "How Prince's Androgynous Genius Changed the Way We Think About Music and Gender". pitchfork.com. Retrieved 2017-04-23. ^ Lavezzoli 2001, p. 92. ^ Touré 2013, p. 3. ^ "Prince – For You". discogs. Retrieved April 21, 2016. ^ "Songs credited to Jamie Starr". discogs. Retrieved May 6, 2015. ^ "Songs credited to The Starr Company". discogs. Archived from the original on August 25, 2013. Retrieved May 6, 2015. ^ "Songs credited to Joey Coco". discogs. Retrieved May 6, 2015. ^ "Songs credited to Alexander Nevermind". discogs. Retrieved May 6, 2015. ^ "Songs credited to Christopher". discogs. Retrieved May 6, 2015. 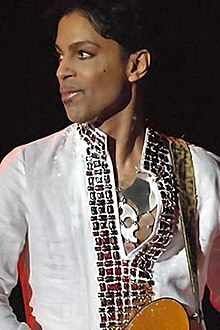 ^ "Prince 'not suing fans': Singer hits back at fansite claims". NME. November 9, 2007. ^ "Prince's ex Manuela Testolini honours late singer in purple jacket". Mail Online. May 19, 2006. Retrieved May 23, 2016. ^ Forder, Rachel (October 19, 2005). "When Hip Gives Way to Hip Replacement". The Daily Telegraph. London. Retrieved May 5, 2016. ^ "Prince death: Five strange stories about mysterious US musician". BBC News. April 22, 2016. Retrieved April 22, 2016. Moskowitz, David V. (2015). "Prince and the Revolution (1979–1986)". In Moskowitz, David V. The 100 Greatest Bands of All Time: A Guide to the Legends Who Rocked the World. 2. Santa Barbara, California: Greenwood Press. ISBN 978-1440803390. Prince is not currently on tour.